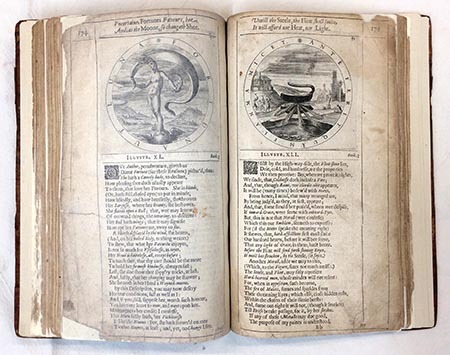 As often happens, after spending five+ years reading & thinking about George Wither’s A Collection of Emblemes Ancient & Moderne, a copy of the actual book was presented to me shortly after publishing Labour Vertue Glorie. Almost a copy; it’s not complete, but is nonetheless interesting in itself. 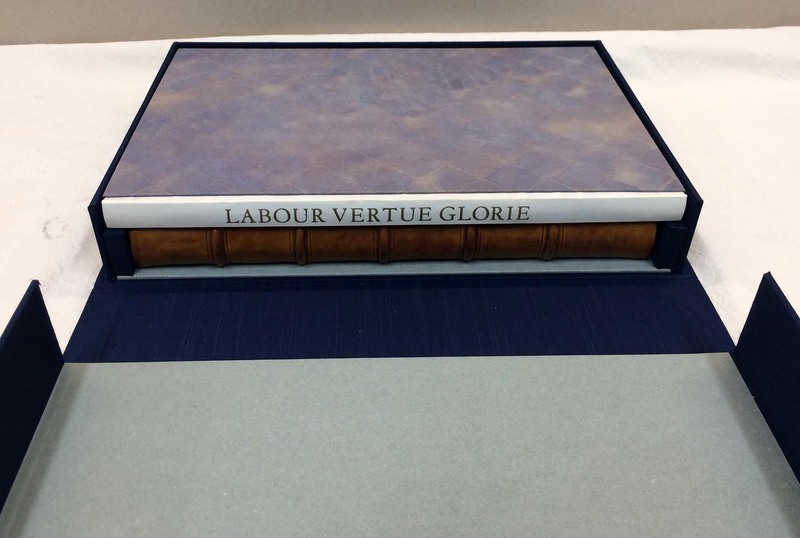 I’m offering it here with a copy of Labour Vertue Glorie, in a custom clamshell box. 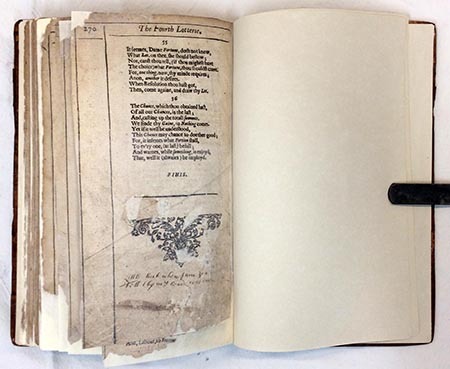 The copy of Wither’s book has undergone, probably recently, extensive repair work. 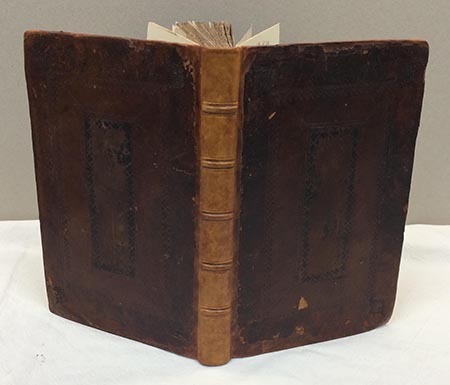 It appears to have been completely disbound and resewn, eliminating whatever stubs remained of the missing leaves. Thus it is a solid text block. 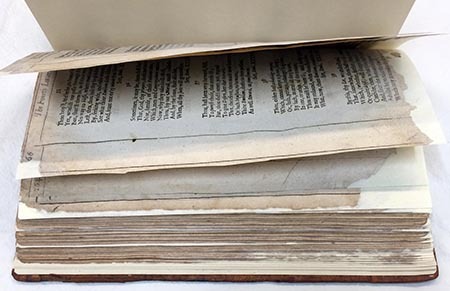 Paper repairs are evident on many pages, but there is little loss to text. 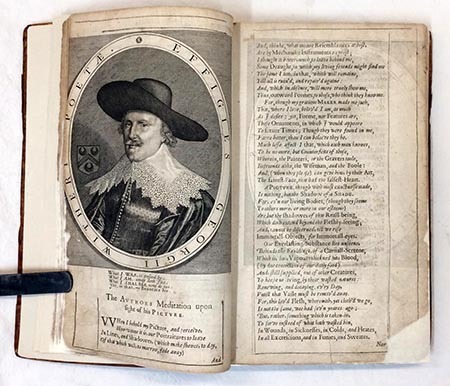 Much of the bottom margin has been trimmed away, and tears on three leaves (six pages) resulted in slight loss to the last line on four pages, and loss to several lines on two. The original, or at least early, blind-tooled calf on the boards has been retained, with some flaking and loss, while the spine and edges have been expertly replaced. The pattern on the boards matches a complete copy of the book I inspected at a university library. The bound volume feels surprisingly solid in the hands, and with appropriate care when turning pages, will withstand regular handling. 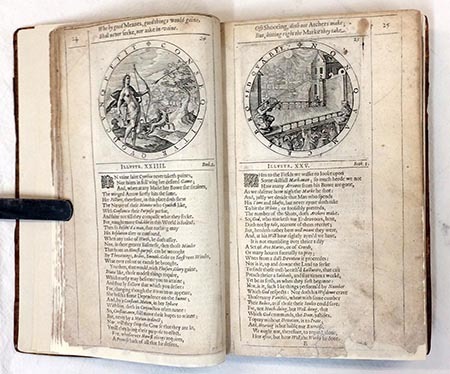 Two of the pages have suffered significant fading (the fifth and six images shown at right). I do not know the cause, but the paper repair on these leaves looks like it might have involved splitting the leaf, and I wonder if that could have caused the degradation. 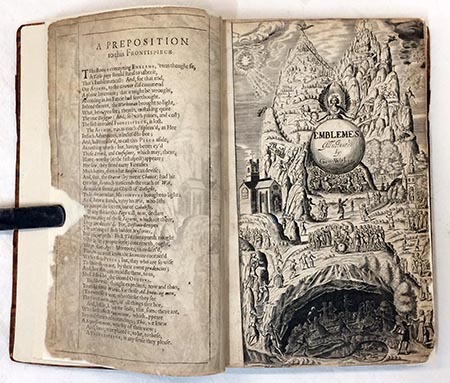 Marshall’s frontis, and Wither’s facing commentary, are present, as are Wither's engraved portrait and the title pages and prefatory remarks for all four books (including two that are reprinted in Labour Vertue Glorie). 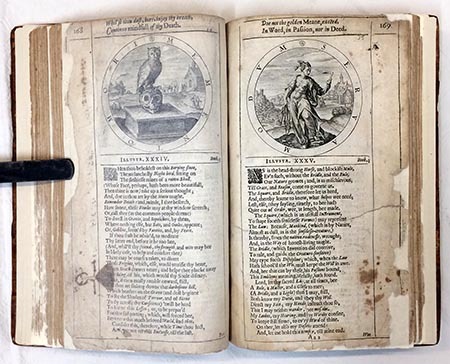 The index, instructions for playing the lotterie, and volvelle page are all absent; the book ends with the last set of lots, which have received extensive repairs and some loss of margin. (Wither's instructions for playing the lotterie, and the volvelles, are reproduced Labour Vertue Glorie.) The fourth image at right is representative of the condition of most spreads. A short biography of Wither, in an elegant (pre-20th century?) hand, has been tipped to the front pastedown. Despite all the deficiencies and loss, this is an interesting copy of an interesting book. 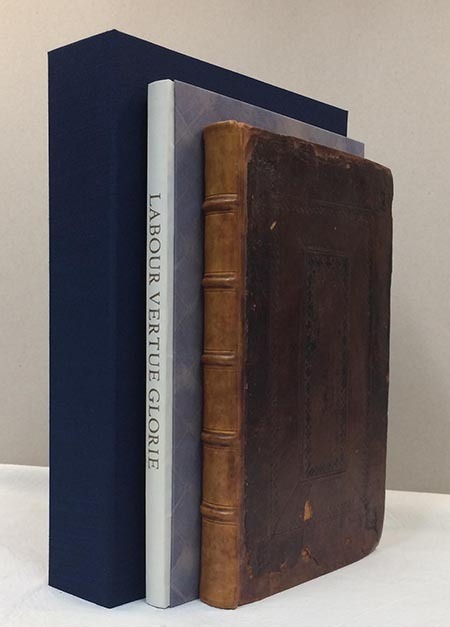 Having essentially three-quarters of the emblems, and most of the accompanying text, the copy offers a greatly expanded opportunity to examine aspects of the book, and Wither’s writing, raised in Labour Vertue Glorie’s commentary. 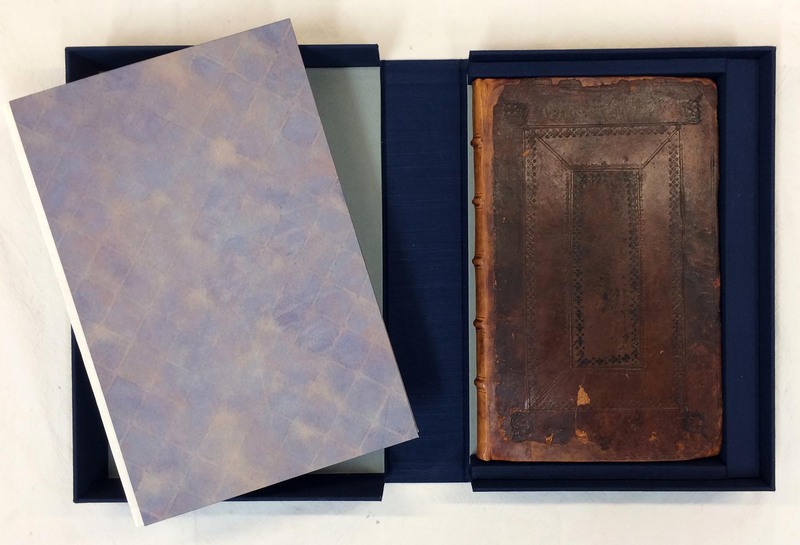 Beyond just the topic of emblems, this set would make a versatile teaching tool, spanning early printing, contemporary fine press publishing, and rare book restoration (vs conservation), with all of the physical and intellectual issues that raises. The first few pages of lots for Book 1 (to lot 19) are also missing.